Iconic jazz/swing trumpeter and singer Louis Prima was born 100 years ago in New Orleans, Louisiana. 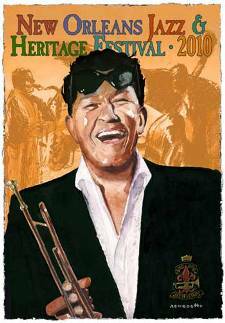 In honor of this occasion, the 2010 New Orleans Jazz festival is launching The Musical Artist as Visual Artist Jazz Festival Poster Series, with a poster featuring a portrait of Louis Prima by music great Tony Bennett. Tony Bennett studied at the School of Industrial Arts (now known as the School of Art and Design) in Manhattan. He paints under his family name of Benedetto. The United Nations twice commissioned his artwork, and three of his paintings are part of the Permanent Collection of the Smithsonian, including his portrait of Duke Ellington, which was recently accepted into the National Portrait Gallery. Limited edition signed and numbered prints of the poster are available for purchase at Art4now.com. The New Orleans Jazz Festival runs from April 23 - May 2, 2010. For more information visit http://www.nojazzfest.com/.